This image shows where NASA's Curiosity rover aimed two different instruments to study a rock known as "Jake Matijevic" in late September 2012. 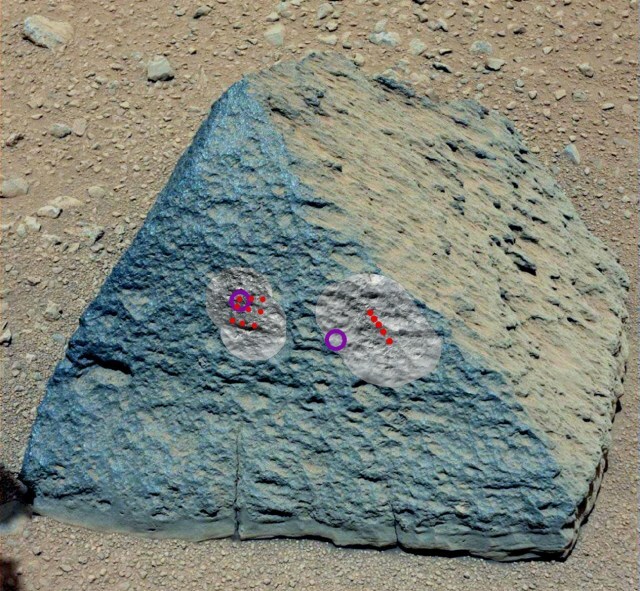 The red dots indicate where Curiosity fired its laser at the rock. The circular black and white images are ChemCam images to examine the laser burns. Purple circles show spots where Curiosity used its Alpha Particle X-ray Spectrometer to study the rock. The colors in the image have been "stretched" to accentuate compositional differences.